Medical Supply Business(MSP) | SHIP HEALTHCARE HOLDINGS, INC.
Our group provides medical materials and consumable supplies to medical institutions, using several different sales methods besides the standard distribution routes. 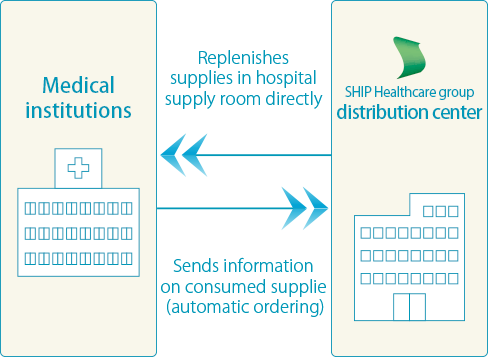 Our out-of-hospital SPD system provides efficient commodity management to enable sales from internal Group distribution centers established outside hospitals. 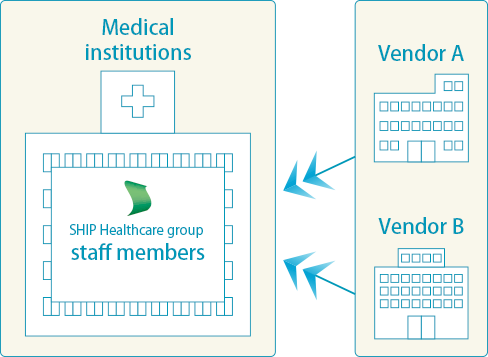 Our in-hospital SPD system enables the Group to procure and manage commodities on behalf of hospitals by means of outsourcing done within hospitals. Our group is also specialist in the provision of equipment used in orthopedics and cardiovascular medicine. Our group includes companies conducting medical consumable sales in the SPD business, companies conducting medical consumable sales in the wholesaler business, cardiovascular equipment dealers Aurum Medical Co., Ltd. and Sunlife Co., Ltd. Nishino Medical Instruments Co., Ltd. in the field of orthopedic surgery, and other leading companies in their respective fields. This diverse array has further strengthened the group’s business base and helped the group to expand across Japan. Going forward, we will continue to promote the absorption and integration not only of human resource talent but also information networks, customer bases, IT systems, merchandising masters, and more in our quest to further enhance intragroup synergy through improved profitability and increased creation of new projects.